This week we have two Great Bento Ideas from the bento community. You could spend hours creating a decorative bento, with intricate cutting and molding and coloring and so on. I read recently of a charaben artist who spent more than 8 hours on one creation! But most of us don’t have that kind of time - unless it becomes a profession (as it has for some charaben artists in Japan). But the bento boxes I am featuring this week from the bento community shows that, with just a few tools and accessories and a great imagination, it’s still possible to create beautiful, cute, appetizing bentoscape. This school themed snack bento by Lian Mama  features pencils made from the bread crusts. I’m guessing that she used the rest of the bread for the spiral sandwiches. There are yellow pear-shaped tomato balloons and cherry tomato ‘cherries’, using decorative picks, to complete the fun picture. No special tools are needed for this bento - just a sharp knife, and a very creative mind! Lian Mama doesn’t mention how long it took her to assemble this, but I’m pretty sure it wasn’t hours and hours…and what first grader wouldn’t love to see this in his bento box? The second bento I’m featuring today is even simpler in concept, though beautiful in execution. 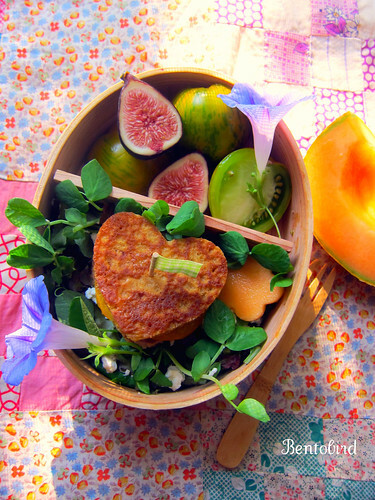 The centerpiece of this gorgeous bentoscape by Bentobird  is a heart-shaped sweet potato pancake sandwich with sausage and tomato. The fruits and greens that surround it reflect the shape of the heart - or is it the other way around? In any case, the whole effect is harmonious and very colorful indeed. Read about this Virginia Country Breakfast bento  on Bentobird’s blog. Look out for another Great Bento Idea next week!